Free, Open Source, and Community Driven! VIreio Perception's bright future is discussed in Neil's Messy Basement. HTC Vive owners rejoice! Vireio Perception 4.0 Alpha 2 is out, and we have proudly added room scale support for Fallout 4. Mark your calendars for June 4, 2016 as the day that a VR driver released room scale support in VR for games that were never designed for that purpose. This is HISTORY! Full OpenVR (HTC Vive) room scale support. Game profile "Fallout4_OpenVR_x64" adds X+Z positional tracking. Game profile "Fallout4_OpenVR_x64_experimental_Y_tracking" adds X+Z and experimental matrix modification Y positional tracking. HUD manipulation for VR mode has been FIXED. There is a special secondary HUD for OpenVR users, but it's still not flawless. SteamVR virtual game screen overlay can be activated on the dashboard. 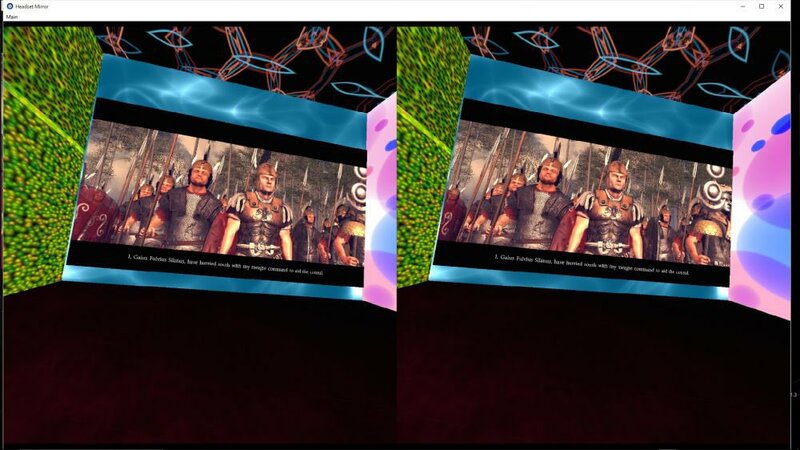 OpenVR fully customizable "VireioPerception_OpenVR.ini" file is automatically created in the game folder. Improved Fallout 4 profile quality. More work is needed. Slight delay added to both Oculus and OSVR tracker to resolve some problems reported by users in official Vireio Perception forums. Read more: Vireio Perception 4.0 Alpha 2 is OUT! Meant to be Seen is proud to share Vireio Perception 4.0 Alpha 1! For those unfamiliar, Vireio Perception lets you take existing games and play them in virtual reality when they weren't designed for that purpose. This complete rewrite of Vireio Perception was primarily made possible by Denis Reischl with support from Grant Bagwell, Simon Brown, Samuel Austin, and Neil Schneider. This is a preliminary release and only works with Fallout 4 and the DirectX 11 API. The game support will dramatically grow as we reactivate features like DirectX 9 and make the Aquilinus profile creation software available. The software will become easier to use, too. Read more: Vireio Perception 4.0 Alpha 1 is OUT! Vireio Perception will be out by Friday this week, and we are all extremely excited. Special thanks to Denis Reischl, Grant Bagwell, Simon Brown, and Samuel Austin for getting us to this stage. Denis rewrote all the architecture, and the game is afoot! This amazing episode of Neil's Messy Basement is all about Vireio Perception 4.0. If all goes to plan, the drivers will be in everyone's hands by Friday - maybe sooner. We don't want to spoil the surprises (and there are several), so prepare for a seated VR learning experience. Anyone who knows anything about virtual reality and virtual reality drivers will be stunned. Remember, the Vireio Perception drivers are completely free and put together by volunteers. It doesn't get more amazing than this. See our up to the minute progress! the source code and contribute! Vireio @alexbdavies @MTBS3D #Fallout4VR must be MUCH better than #Vireio by 2017. #Vireio getting diverse DX9/DX11 game support. FO4 was practice.